A man has been arrested on suspicion of a murdering a woman who was found stabbed to death at a London home. 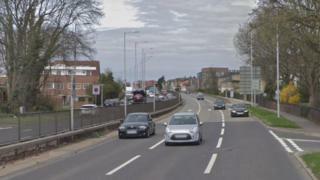 The 50-year-old woman was found at the home off the Great North Way, Hendon, at about 10:20 GMT and she died at the scene. A man aged 54, thought to be known to the woman, was arrested at the scene. Officers said they were not looking for anyone else. Police said they were still trying to contact the woman's next of kin.